1.Watercoloring! Sometimes I just get in the mood to watercolor, and it always feels so nice to pull out my brushes and paints and let the creativity flow. 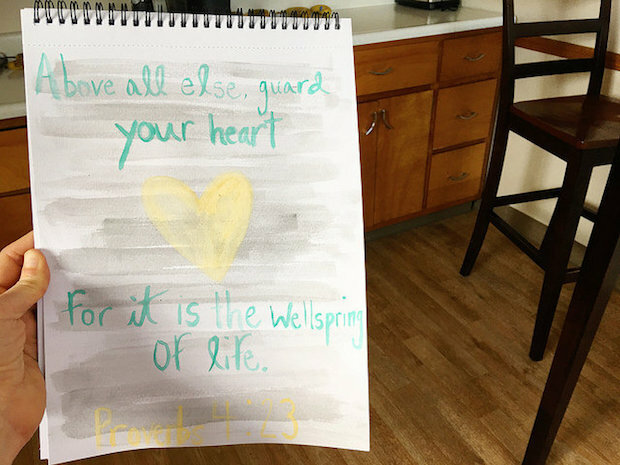 This time I painted one of my favorite scriptures, Proverbs 4:23. 2. Mavis loves the dishwasher. She just climbs on up and tries to eat whatever crumbs she can find! She reminded me of my parents’ cocker spaniel, Brandy, when she was about the same age. I looked back in my archives, and sure enough, I have a picture of Brandy doing the same thing! 3. Brushing up on my Spanish. Jimmy and I sponsor a sweet boy in Mexico at Ninos de Mexico, and we send letters back and forth. I decided to write to him in his language and I’m really hoping I didn’t completely fail. I can just imagine him opening the letter and being like “What is this woman trying to say? !” LOL. 4. We love our Petzi Treat Cam. Jimmy got me this treat camera for my birthday last year and I (surprisingly!) don’t think I’ve blogged about it?! We are able to talk to the pets, shoot treats out of the camera, and take pictures. I seriously have way too much fun talking to our fur babies when we aren’t home. 5. 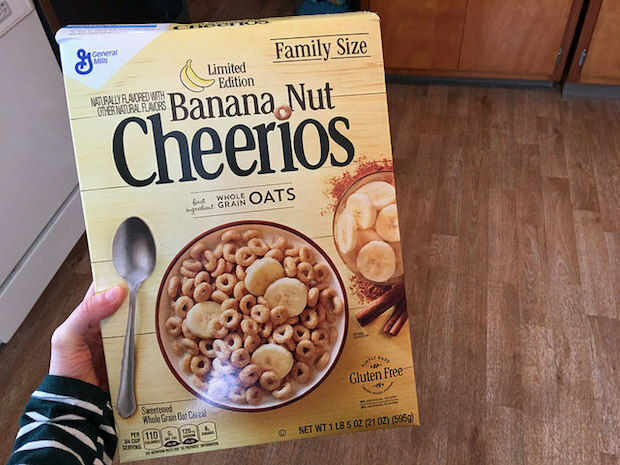 Banana Nut Cheerios. I feel like I post about cereal constantly. Maybe I should do a post on cereals and what I rate them on a scale of 1-10, haha. I’d give these Cheerios a solid 8.5! 6. Pittsburgh in the morning. 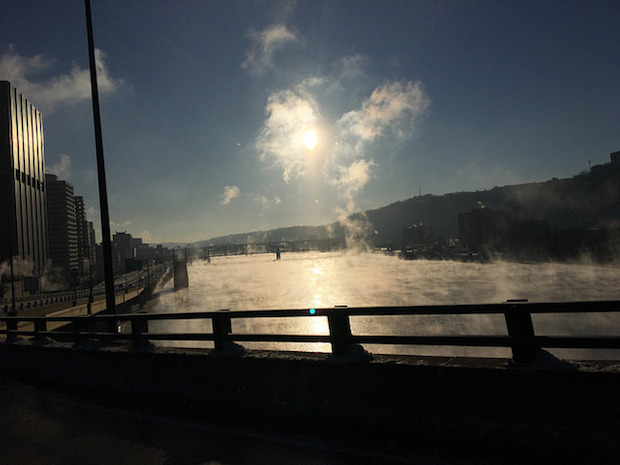 Jimmy and I were driving to church on Sunday and I snapped this shot as we came off the Fort Pitt Bridge. The river was steaming because the water was warmer than the air. So pretty! 7. Mom + Mavis. These two are just too cute together! 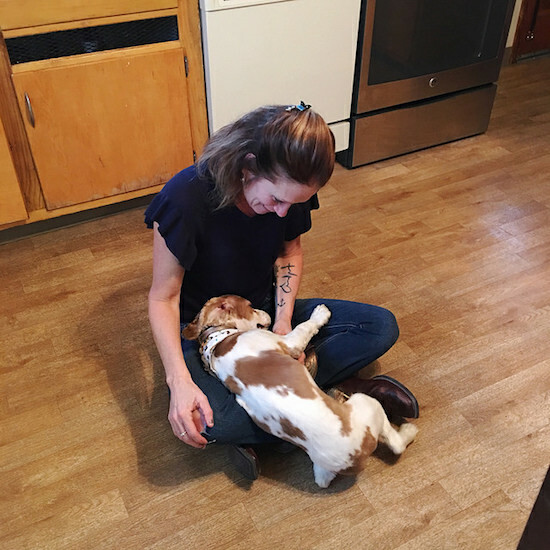 What would pictures of your life lately look like? 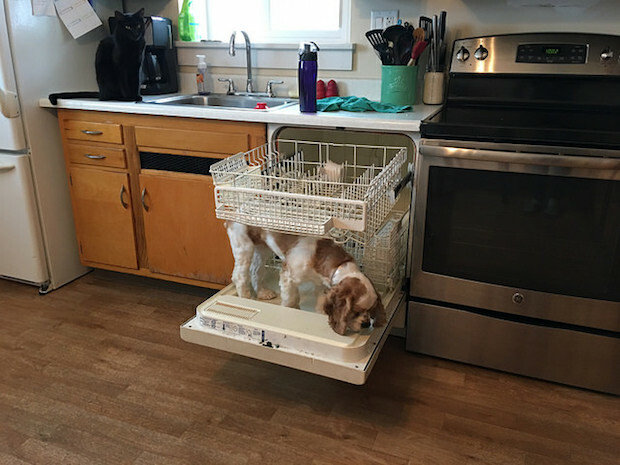 Brandy still climbs into the dishwasher….. Thanks, Nicole! I do recommend the Cheerios if you like banana!! I am also a big fan of the Very Berry Cheerios! The picture of Pittsburgh is so pretty! It was so warm over the weekend that the big piles of plowed snow had steam coming off of them. Crazy to see in my opinion. A picture of my life lately would probably involve me curled up on the couch with a blanket or a book in front of the fire. The cold weather just makes me want to do cozy activities! Thanks, Maureen!! Yay for warm weekends! I can’t wait till it’s just always warm, haha. Spring/summer can’t come soon enough! Love the picture of your life lately. I want to do that right now!! It’s soo much fun! Every time we’re at church, my parents ask to see the pets on the treat cam, LOL! 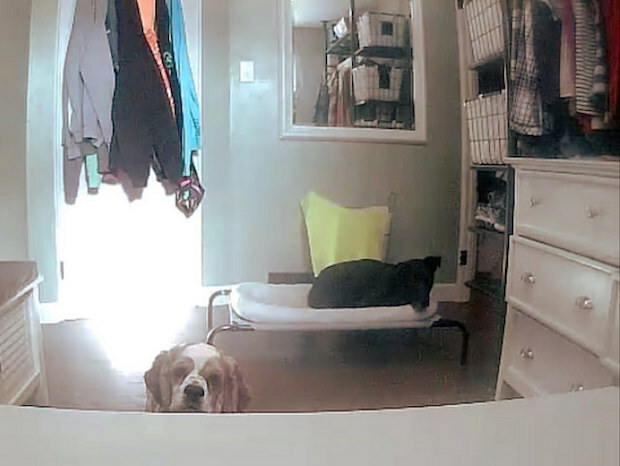 I love that you guys can see Oreo on your video surveillance!! I bet that is reassuring! Thanks for the compliment on my watercolor!! 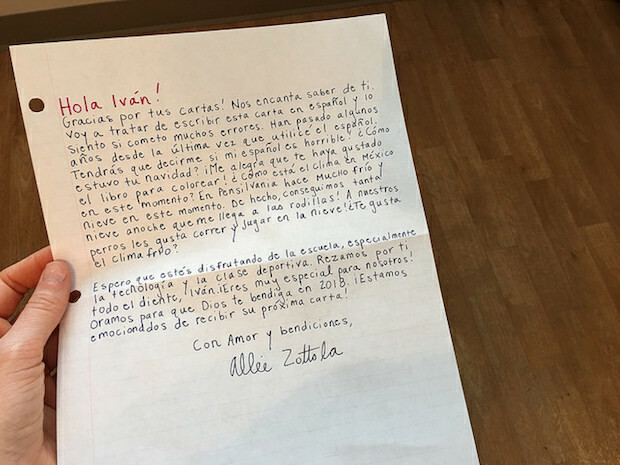 I bet the boy in Mexico will be so excited to get the letter written in Spanish. I’ve found that people who speak languages other than English are usually just so impressed when someone makes an effort to communicate with them in their language. The Chinese people I worked with were always so complimentary when I’d try Mandarin; they were proud of me for trying even if I didn’t get it perfect. Same goes for the Spanish speakers at a former job here in Albuquerque. Good for you for making the effort! Haha I love the pic of Mavis in the dishwasher- super cute. She is something else, I’ll tell ya!! My dog used to do that all the time growing up! Then he would get milk or juice on him from the top shelf dripping down on him while he was licking the bottom! Haha, so funny!! That totally happens in our house, too!! All kinds of spills on the dogs’ (and even the cat’s) heads! I’m sure that little boy will love that letter! I’m actually trying to learn Spanish right now haha! Aww, I hope he does!! Yay for learning a new language! I hope it’s going well!